It’s a beautiful calm Sunday morning and you’re in bed enjoying your well-deserved sleep. Out of nowhere your smartphone’s alarm clock goes berserk at 7:30AM, conveniently forgetting the fact that it’s the weekend. Come the work week again your bloody smartphone is back at it, ringing in the middle of an important meeting, forcing you to leave the conference room in shame. And worst of all, your phone’s battery is dead before the day is over. Do any of these embarrassing and frustrating situations sound familiar? If so, ProfileComfort can help you put your mind at ease. ProfileComfort is an app that can control and initiate automatic actions. At the start menu, the app lists eight default profiles for you to choose from. Let’s start by taking a look at the “At Home” profile. Just like with any mobile profiles, you can add your own actions and conditions. The most important variable to add before anything else is the location. 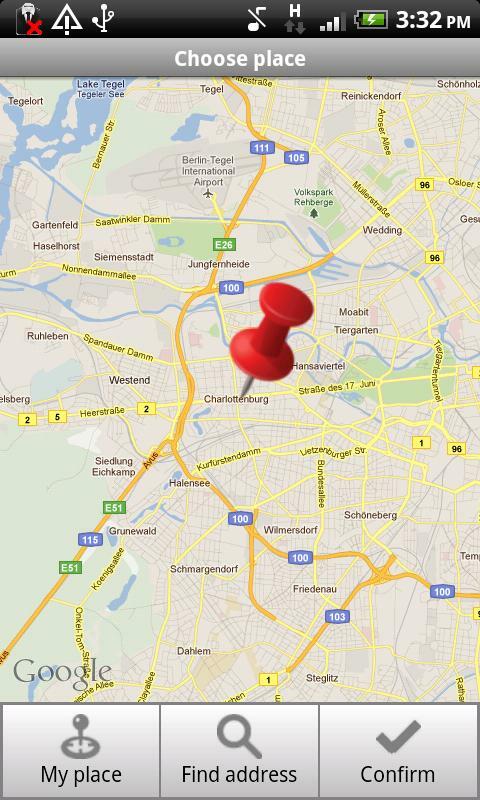 Tap on location to select your home address. Then you can determine a radius within which this particular profile will be activate. I would recommend setting up a distance of at least one kilometer. You can even select multiple variables to work simultaneously. After you’ve set up your profile, it is probably advisable to determine what your smartphone’s response should be to each specific situation. That’s more than enough to give you the necessary tools to create a customized set of profiles. There are many examples of useful profiles, but it really depends on your lifestyle. 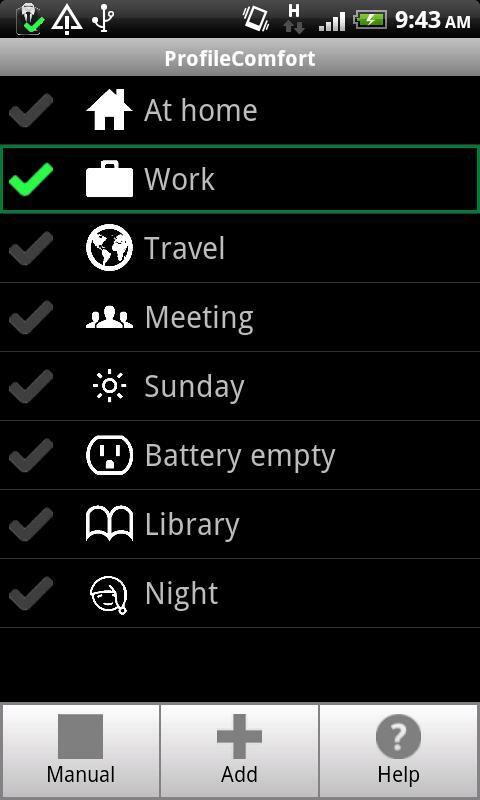 Creating seperate profiles for work, meetings, weekends and low battery status is just the beginning. Back at the main menu you can see which profiles are currently active. Each profile can be turned on manually by ticking the respective checkmark. It is, however, advisable to use the automatic profile manager that can turn profiles on/off based on the location, time of day and other variables. And it wouldn’t be an app if it didn’t come with some basic settings. You’ll need a Gmail account to send notification emails. That’s right, Gmail is the only way to go. Thankfully, there’s barely an Android user out there without a Google account. The only snag is that you’re password is shown in full letters when you sign into your email, so there is definitely a security risk there. Not only that, but your password is saved unencrypted. Totally unacceptable! Bottom Line: ProfileComfort is a cool app for those looking to save on battery life and protect them from embarassment/lack of sleep. Obviously, there are a lot of different ways to use this app to fit your particular case. If you’re looking for a more complex profile manager, Tasker remains a better option. But for regular users just looking to have a reliable and easy-to-use app, ProfileComfort fits the bill! Yeah, there are a bunch of similar apps available on the Market, including Tasker just to name one of them. Compared to most of them, ProfileComfort has some remarkably user-friendly controls that are straight-forward and to the point. Although you may feel a bit limited in terms of functions, the app is perfect for the average user. ProfileComfort runs smoothly and reliably all the way through. After the profiles have been activated and set-up, everything runs quietly in the background. How pleasant!